Several state legislators representing Madison County held a town hall listening event Monday at the Huntsville City Hall. Sen. Arthur Orr said that the purpose of the forum is for the legislature to hear from the public and the legislators, including Speaker of the House Mac McCutcheon, listened as Madison County resident after Madison County resident spoke for three minutes on the topic that most interested them. Speakers were asked not to repeat points made by someone else and not to talk about local or federal issues unless the state legislature can do something about that issue. Veterans advocate Will Webb said that sixteen years of a brutal terror war has resulted in 52,000 veterans being critically injured and hundreds of thousands suffering from stress and post-traumatic issues. What they do is critical, and he asked for their continued support. Lori McCauley with the National Coalition of Black Women said that early puberty awareness is causing them to develop breasts early which is causing them to develop cancer earlier in life and urged that awareness be raised. McCauley also asked for legislation outlawing the selling of drug paraphernalia near a school or a church. Rene Breland with the Top of Alabama Regional Council of Governments said that as our population greatly increases in Madison County our elderly population also increases increasing the need for services. Breland said that the TARCG managed Medicaid waiver program served 300 residents of Madison County in their homes at a cost of 24,0000 versus $21 million if they had been taken to a nursing home. Breland said that their food for seniors meals program serves over 1400 seniors and they also provides counseling services through the SHIP program. Mr. Johnson spoke against raising the gas tax. I am pleading to you to govern wisely.” “Empower the state auditor to audit not just the property but also the books. Empower him to correct wrongs that he caught in the state budgeting process. Put back the $63 million diverted from roads and bridges and end all the earmarks. Michael Polomini urged that the legislature ban any candidate, with the exception of the President, from receiving any campaign contributions from people or organizations from out of state. He also urged the legislature pass a road usage tax for electric vehicles and bicycles. Michael Jennings said, “This 12 cent gas tax is a tax hike. It is a tax on the people of Alabama. It is a regressive tax. Mary Moore is the Vice President of the Alabama A&M Alumni Association she said that the University needs, “Funds, funds, funds. Please consider providing funds for Alabama A&M University. Sheila Holt is the director of UAH’s AMSTI program. Jerry Burnett is the President of the Huntsville – Madison County NAACP. Hannah Joy Ellis warned that each year 1000 local women are given cesareans. It seems suspicious. One local hospital has a 40 percent cesarean rate. Ellis said that she wants the cesarean rates of doctors and hospitals made public and wants a change in the midwives bill to allow women who have had cesareans to use home birth midwives. Ellis said that Black babies in Alabama have twice the mortality rate as White babies and Black women are given cesareans at a much higher rate than White women. Caroline Jones is the State leader of Moms Demand Action to Stop Gun Violence. “We ask you to vote no on Senate bill four,” Caroline Jones said. “Permit-less carry is dangerous and will only exacerbate an already huge problem. Gail Williams is with Alabama Arise she urged the legislature to end the sales tax on food and to expand Medicaid, warning that most rural hospitals are operating in the red and predicted that more of them would close without Medicaid expansion. Jaquelyn Clark spoke out against the requirement that mothers, like her, who have had cesareans in the past can’t use nurse midwives. David Harrah is with the Professional Firefighters Association he spoke out in favor of firefighters being able to get cancer coverage on Comp for firefighters. “One associations claims that could potentially bankrupt our cities,” Harrah said. In no way is claims bankrupting any cities. Ms. Thomas with the National Coalition of 100 Black women warned about a growing bullying problem in the schools that is not being addressed. Conservative TV and radio host Dale Jackson said that if the legislature raises fuel taxes, and it might be necessary; then show some good faith and repeal the sales tax on food. Jackson complained that Al.com and other newspapers make hundred of thousands on required legal notices which he says is out of date in 2019. Nelson asked the legislature to raise fuel taxes to repair roads and bridges, fund more park and ride, ride sharing, and mass transit She also suggested passing a vehicle miles traveled fee and asked the legislators to consider eliminating sales taxes on food and on thrift stores. Mr. Barnes. an Alabama A&M political science student, suggested passing a lottery to provide tuition for college students and expanding work study programs to pay for college tuition. Huntsville and Madison County is one of the fastest growing areas in the state. Huntsville is predicted to become the large city in the state within four years. 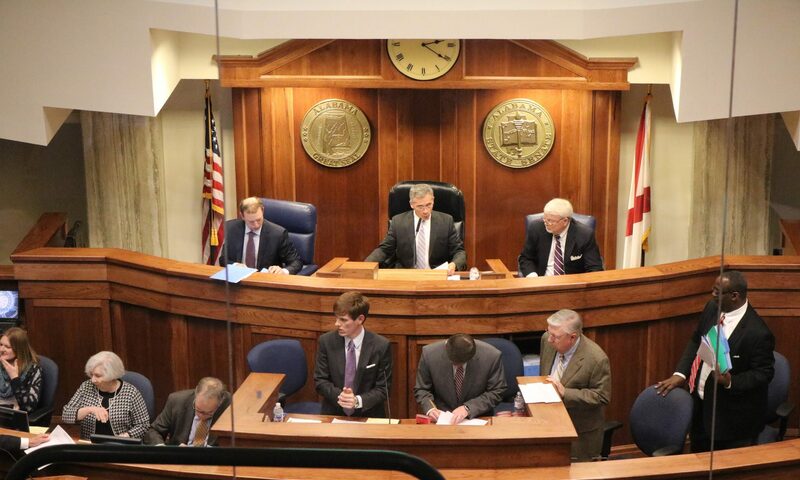 The 2019 regular legislative session begins on Tuesday, March 5 in Montgomery.